Food, too, is a cultural unifier. Whatever angst one may feel toward’s a country’s policies, we can at least appreciate their culinary gifts. What would America be without foods like hommos, tacos, egg rolls or, perish the thought, pasta? Even if language doesn’t allow, passing a plate of food can stimulate the universal sign language of thumbs up, smiles and friendly gestures. And what better melting pot to celebrate culinary diversity than Vancouver, the ideal Olympic host city for reveling in both sport and food. This recent flurry of press around exceptional Chinese food led me to Susanna Foo’s(1995) “Chinese Cuisine” cookbook. Chef Foo, often referenced as America’s leading Chinese chef, brings a global awareness to the table. In the introduction to her book she writes, “A good cook should be open-minded,” taking a fresh global approach to recipe ingredients. Her cooking style borrows the best techniques, herbs and spices from around the world, much like the Olympic games unite the world’s greatest athletic stars. The enticing aromas emerging from this pan would woo even the most recalcitrant of world players around the dining room table. Marinate shrimp in vodka, occasionally turning, 30 minutes. 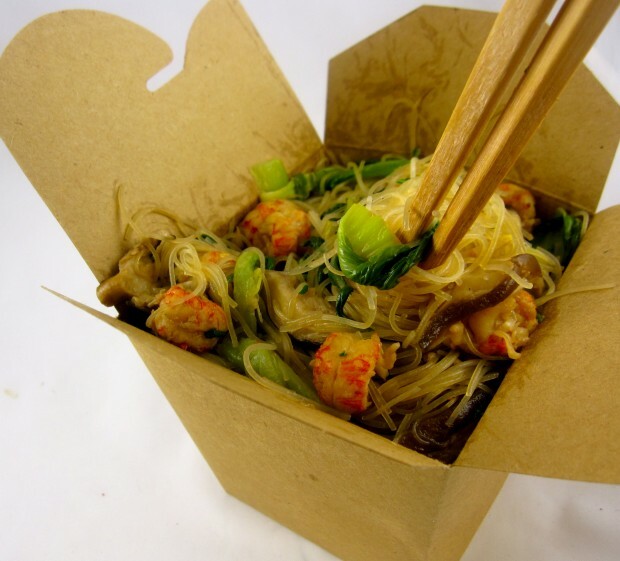 Cover the rice sticks with water and soak 15-20 minutes, separating noodles with your fingers as they soak. (Do not oversoak or they will be too soft and the dish will be ruined.) Drain. 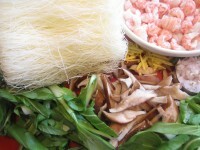 Cut noodles in half and set aside. In a large heavy skillet or wok, heat oil to high heat. Add the shallots and ginger and stir-fry until shallots begin to brown, about 2 minutes. Add the mushrooms, shrimp and vodka and stir-fry 1 minute. 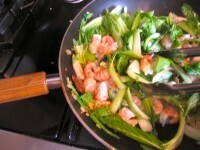 Add greens and stir-fry until just limp, about 2 minutes, lifting greens up with tongs to evenly cook. Add stock, soy sauce and rice noodles to pan. Reduce heat and simmer until liquid is absorbed, lifting and incorporating noodles, vegetables and shrimp with tongs, about 6 minutes. Season to taste with kosher salt, if needed, and red chili flakes. *Available at Asian groceries and most grocery stores with a good Asian section.